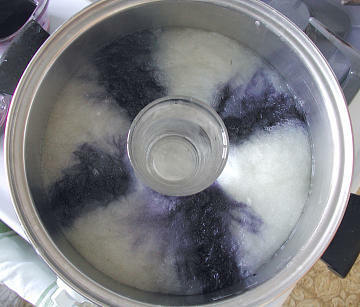 There are several basic methods for dyeing roving or yarn. With this method you can use one pot to add two or more colours at once. By making slight changes to each step, you can achieve quite a few different effects. In this example, I'll to use wool roving to illustrate two variations to this one pot method. 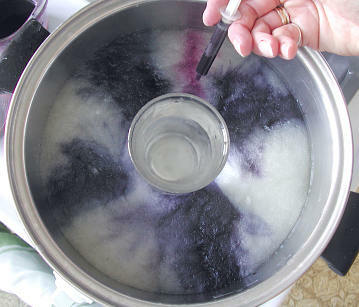 Start by laying your roving or yarn in your dye pot. How you lay the fiber in the pot will affect how the dyed yarn or roving will look, so try a few different ways and see what you like. I generally roll up my roving into a loose spiral (if you make it too tight, the dye won't penetrate), or lay my 1 yard skeins (i.e. 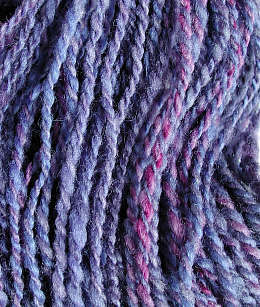 skeins wrapped on a one yard frame or kniddy noddy) on top of one another to make a big yarn donut. Sometimes, as in this example, I put a heat resistant drinking glass in the middle of the donut to help keep the colors distinct. Now add plain water. Fill the pot leaving room to pour in dye. The less water there is, the less the dye will migrate. I like to use just enough water to cover the fiber. If you are using a glass, then fill it up too, so it won't float. 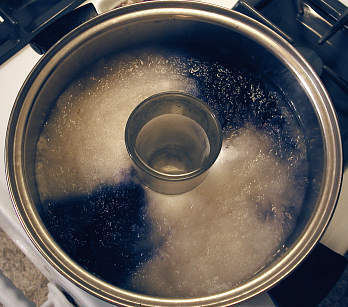 Heat the pot of fiber up to just below simmering -- boiling or bubbling water will not only felt your fiber, but it will cause the different colors to mix together too much. Prepare your dye. 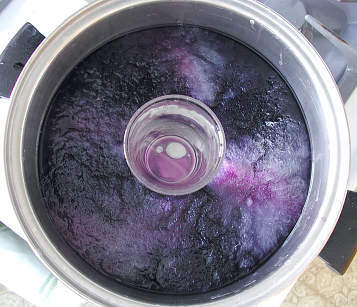 I add a bit of vinegar to the dye, but you can add it to the dye pot if you like. 2 to 4 colors seem to work best. The more you try to cram in the pot the more mixed up the results seem to get. Similar colors might work well with more, and I suppose if you had a really big pot, you could try more, but my pot just nicely holds a 1 yard skein in the round. 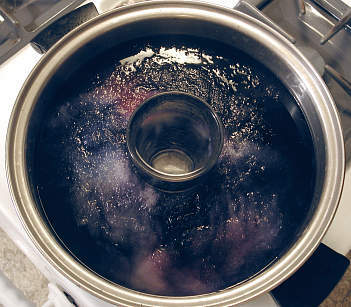 If you can, it's best to get your dye up to the temperature that will set it, so when you pour it into the pot it can start dyeing right away. The longer it has to heat up, the more it will migrate over the whole pot. Now carefully pour the dye onto parts of fiber. When I use the spiral roving or donut shape, I tend to pour the dye in pinwheel sections (or sun rays out from the center), but again, find what works for you. Different patterns will yield different results. If you pour slowly, the colors will stay fairly separate; if you pour faster, they will overlap and blend more which isn't necessarily a bad thing. Of course you will always have some overlap where the colors meet. I have even poured the colors leaving clear sections in between. This results in lighter hues in the clear parts (they don't stay white). 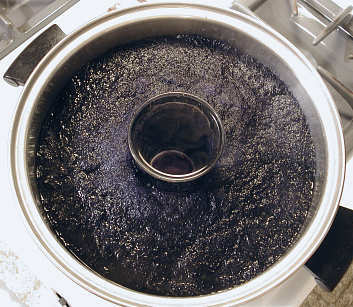 Pot 1: I prepared three analogous (similar hues) dye colors: Navy Blue, Royal Blue and Purple. In this pot I will pour faster. The colours will blend more and the graduations between them will be much more subtle. In the photo at the right, I have added Navy dye to two areas of the roving. Pot 2: I prepared two colours: Navy Blue and Purple. In this pot I am using a syringe to slowly apply the colours to very specific areas of the roving. The result will be a much stronger difference between each of the coloured areas. In the photos at the left, I have carefully added Navy Blue dye to the roving. It is already beginning to spread, but this is okay. Now it's time to move on to the next colour. Pot 1: I have added Royal Blue dye adjacent to the Navy dye. Pot 2: Again, I'm using the syringe to carefully apply the Purple dye between the areas of Navy dye. Pot 2: I'm only adding two colours to this batch, so I'll skip ahead to Step 7. Pot 2 is done, but pot 1 still needs one more colour. 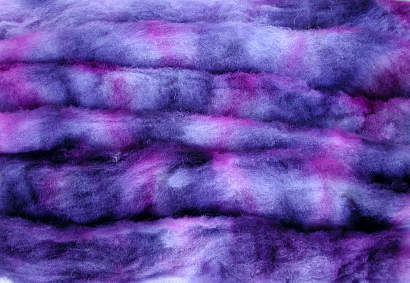 Pour the purple dye on the roving in the remaining spaces. 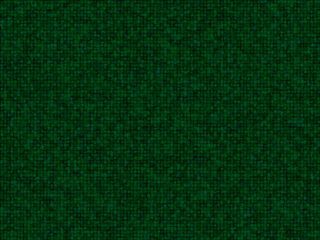 If you are using more colours, continue adding them in your chosen pattern. You can also just pour at random. If you are having trouble getting your fiber to stay underwater, just set an old plate on top. It's even okay to let the plate float on top. All it has to do is hold the fiber underwater -- anything that sticks out won't be dyed (which is actually part of another dye method). Now let the fiber cook in the dye to set the colour. 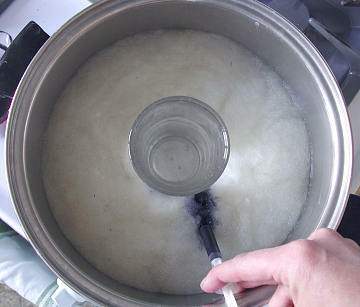 Once your pot has reached the right temperature (just below simmer) start timing. In 20 - 30 minutes it should be done. 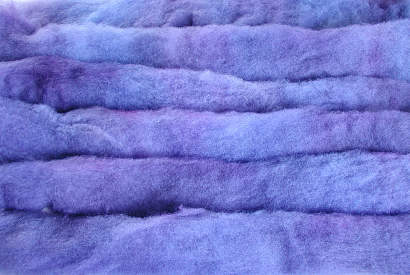 If you are using RIT dye (as in this example), you will be amazed at how mixed the colors have become, but don't dispair. This is just the cellulose dye. When you rinse out your fiber you will see that it has dyed the areas	separately. Rinse out the fiber. 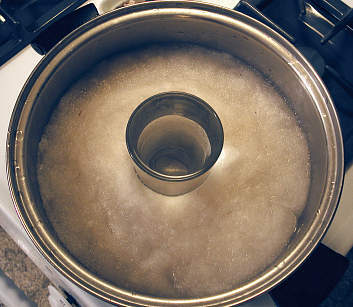 Start with very hot water and slowly change to cool water with each rinse, or once the water stays clear, let the pot sit to cool. This is especially necessary if you are dyeing roving, as a sudden change in temperature (often called shocking) may cause your fiber to felt. Gently squeeze out the excess water. You can use the spin cycle of your washer to remove the water, too. You can spread out the roving to help it dry faster. 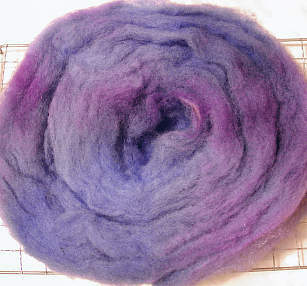 For this example, I dried the roving in the round so you could see just how the dyed areas look. Because I poured the dye in faster, the colours have merged and mixed somewhat. 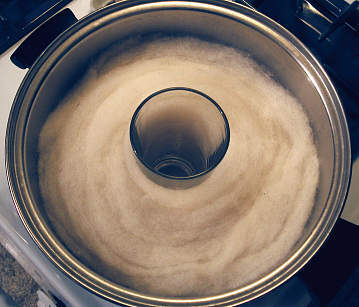 Here's the Pot 1 roving in the round. Here's the Pot 2 roving in the round. Compare how the colours stayed fairly separate here with how they blended more in Pot 1. If you spread out the roving, you will see varying bands of colour along it's length. Pot 1: The faster pouring resulted in subtle blending between the three colours. It's hard to find where one ends and the next colour starts. Pot 1 roving laid out in rows. Pot 2 roving laid out in rows. Pot 2: Adding the dye slower and more precisely resulted in distinct bands of colour. Before you spin up your beautiful roving, think about how you want the colour to lay on the finished yarn. If you spin this thick roving into a thin yarn, then each colour area will be stretched out for yards and yards with very little change until the next group of yards and yards of yarn. If you then knit this yarn in the round for the body of a sweater, you would get wide horizontal stripes of colour going up the sweater. 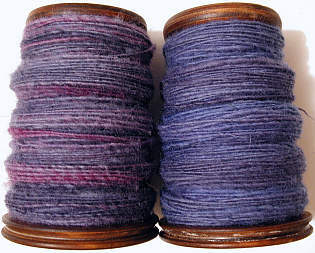 If you divide the roving up along its length into narrower strips and then spin each strip into a thick yarn, you will get colour changes occuring at nearly the same distance as in the dyed roving. If you then plyed the resulting singles, you would further integrate the colour shifts. 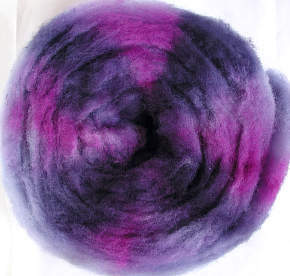 Alternatively, you could grab random pieces of the roving as you spun, or even card sections together to blend the coloured fibers for a soft heathery look. I chose to divide the roving along its length before spinning these singles. Pot 1 roving is on the right, and Pot 2 roving is on the left. Here's how the singles look plied together. 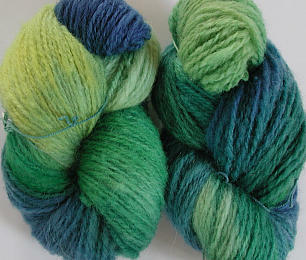 By using similar colours, the result is a rich looking harmonious yarn. Imagine if I had used Red, Yellow and Blue dye. 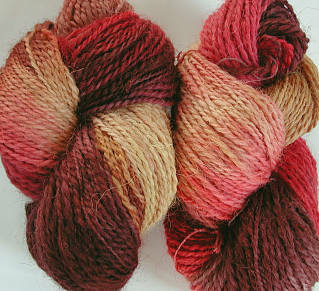 Here's what it might look like if you use this one pot method to dye the finished yarn instead of the roving.